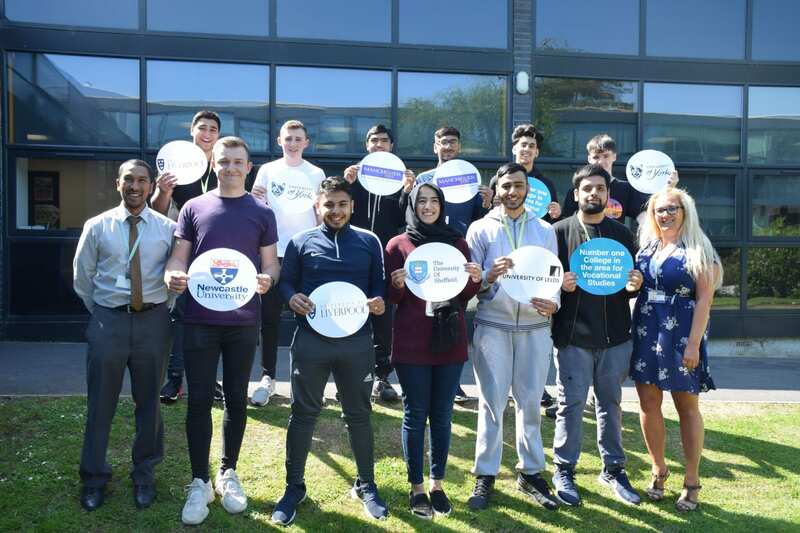 A record 14 vocational Business students at Nelson and Colne College have received offers from Russell Group universities – the best in the country. University offers afforded to students achieving Distinction and Distinction* grades across the board included prestigious places at Leeds, Liverpool, Manchester, Newcastle, Sheffield and York with the majority of students taking up opportunities to study Business Management, Management or Law. Vocational Business students at NCC study a range of modules including topics such as the economic environment, introduction to marketing and social media, HR management, business law, web design and account management. Nelson and Colne College has a Career College ethos and as well as developing business knowledge skills during the course, students also benefit from trips, visits, guest speakers, mentoring and work experience – all designed to get students ready for their futures. Ali Waris, 18, from Brierfield achieved Triple Distinction* in BTEC Level 3 Business and is progressing on to the University of Leeds to study Management. The former Marsden Heights Community College student said: “The assignments I have completed at NCC have helped me reach university standard. Not all of the group have taken up their Russell Group offers, however, with others securing brilliant Apprenticeships opportunities. These include Faye Hartley who is taking up a Merchandising Apprenticeship at leading Tesco brand Florence and Fred in London and James Osborne who is progressing into a Management Apprenticeship at Morrisons, based in Wakefield. Former St Christopher’s CE High School student Faye, 18, from Burnley, achieved Triple Distinction* and was successful at every stage of the Apprenticeship process, attending national assessment days and interviews to secure her position. She said: “I’m really excited to start my Apprenticeship in September! My ultimate ambition is to be a buyer for a huge fashion brand. James, 19, from Blackburn also achieved Triple Distinction*. The former Ribblesdale High School student came through a gruelling recruitment and selection process from a very large pool of applicants to gain a place at Morrisons. He said: “I’m looking forward to starting my Apprenticeship, it really is a great opportunity for me. Vanessa Harwood, Curriculum Leader for Business at Nelson and Colne College said: “It has been a bumper year for the Business department at Nelson and Colne College and I am thrilled that so many of our students have secured amazing destinations. “To have 14 of our students considered for Russell Group university places – some of the most coveted and highly sought after – is a brilliant achievement and we wish all of our students heading off to university every success going forward.